The Secretary-General met with H.E. Mr. Michel Joseph Martelly, President of the Republic of Haiti, today. They discussed the current situation in Haiti, including political developments and the cholera epidemic. 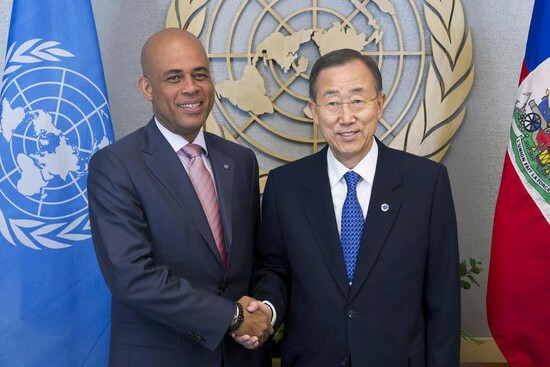 The Secretary-General commended President Martelly for his leadership in advancing reconstruction and stabilization efforts. He called on the President to continue working closely with his Special Representative in Haiti on the further consolidation of the United Nations Stabilization Mission in Haiti (MINUSTAH). They noted that this process should go hand-in-hand with the strengthening of the Haitian National Police. They discussed the need to finalise the establishment of a permanent electoral council so that the long overdue local and legislative elections are held in a credible and transparent manner.